One is the largest single resource development in Australia’s history and the other is the largest offshore gas-processing platform ever installed in Australia. Here, we take a look behind the scenes at pumps in two of Australia’s biggest LNG projects and what other offshore platforms can learn from them. Gorgon and Wheatstone, both located off the coast of Western Australia, have played a significant part in Australia’s LNG story since their construction in 2009 and 2011, respectively. While there was mostly international companies involved in the development of the plants, Australian company Sterling Pumps represented the local industry through the supply of the main seawater supply pumps for the Gorgon plant and submersible pumps for Wheatstone – an open drain application and a temporary fire water pump. Sterling Pumps Marketing Development and Project Engineer, Hamid Shilani, said there was a lot to consider when designing and manufacturing pumps for projects of this size. 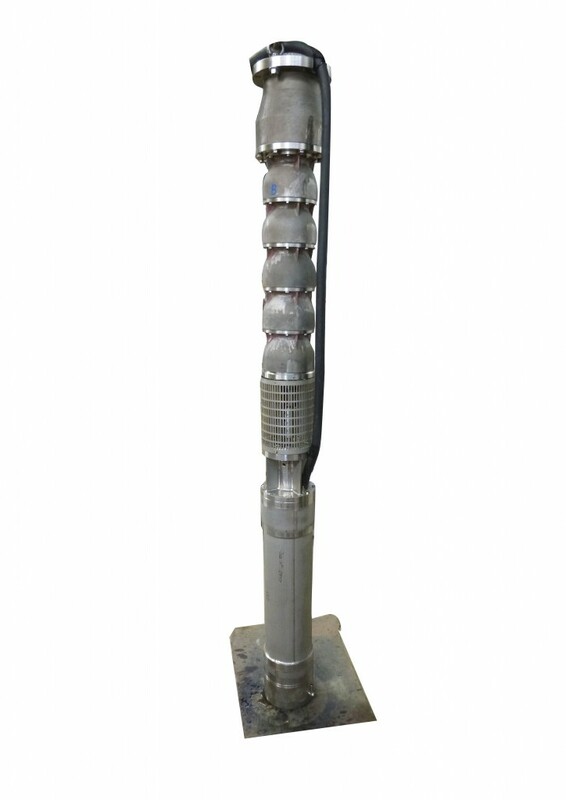 “The vertical turbine and submersible pumps at these plants needed to withstand high temperatures and a very corrosive environment while running 24/7. “We worked closely with consultants to determine the specific pumping requirements and decided to use 25 per cent chrome, super duplex stainless steel materials for the pumps, as this is one of the best grades of stainless you can use to withstand high corrosive environments,” Mr Shilani said. Operated by Chevron Australia, the Gorgon Project on Barrow Island, located 60km off the coast of Western Australia, includes a three train LNG facility and domestic gas plant which can produce 15.6 million tonnes of liquefied natural gas per annum. The first LNG cargo departed the plant in March 2016. Mr Shilani said Sterling supplied two vertical turbine pumps, with surface mounted electric motors on top, which continue to be vital components of the plant’s operation. 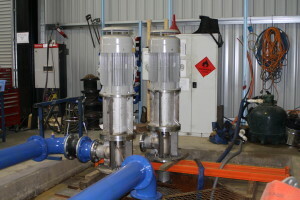 The pumps at Gorgon were directly installed in the seawater application with 20,000 parts per million (PPM) of chlorine, making the environment very corrosive. “The temperature can reach 35 degrees so the pumps had to be able to tolerate high temperatures, with a 25 year life span design. “Corrosion and reliability were our main concerns, especially because they were running 24/7 and couldn’t afford to be shut down, which is why we used super duplex materials. “Not every pump supplier can manufacture pumps in super-duplex, or even duplex, copper nickel or bronze, especially in Australia,” Mr Shilani said. Chevron’s other major LNG project, Wheatstone, consists of two LNG trains and a domestic gas plant, located 12km west of Onslow. The plant’s two LNG trains have a combined capacity of 8.9 million tonnes per annum and its first LNG cargo is anticipated to be deployed by mid-2017. Mr Shilani said Sterling supplied two pump orders for Wheatstone – one 2.2kW pump for an open drain application and a temporary seawater pump for fire application during the commissioning phase. “The fire pump was made of SS316 material with a submersible motor in 22 per cent chrome, super duplex stainless steel. The temporary fire water pump was pumping seawater, and the open drain pump was pumping a mixture of hydrocarbon and seawater. “The open drain pump was only intermittent, running 24/7 for 18 months, after which they took it out and reinstalled it for a different purpose on the plant, where it’s still running today,” Mr Shilani said. Mr Shilani said that given oil and gas projects usually had tight tolerances and specific requirements, there was a lot that could be learned from the pump applications at Gorgon and Wheatstone. “Sterling doesn’t only offer standard pumps, we design and manufacture to fit each different application, which is what is needed in all offshore oil and gas projects – there isn’t a one-size-fits-all approach,” Mr Shilani said. “For any project, the main objective is to supply a pump that fits the customer’s application. With this in mind, we looked closely at design capabilities, manufacturing and testing. Mr Shilani said suppliers need to look at all aspects of an oil and gas project to ensure they are providing the best possible products and solutions for each operation.